Like Janice Levy's story? Read another article on her teaching methods! "I have always pushed my students very hard. 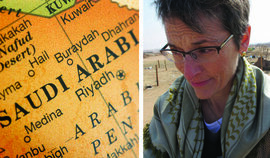 I think, though, that after my experience in Saudi Arabia, I pushed them harder," says Janice Levy, professor of cinema,photography, and media arts, who spent her recent sabbatical teaching introductory photography at Princess Noura University. Levy's photography students met for six hours a day, five days a week, and while the pace was grueling, spending time with her Saudi students was the best part o her day. "The women had the most amazing imaginations and were creative in ways I never anticipated, especially because many of the students were dealing with cultural and religious obstacles that made it difficult for them to photograph." When Levy returned to Ithaca College last fall, she was determined not to accept excuses from her IC students. "It got to be a bit of a joke. When I would chastise my students for not doing their best, they would laugh and mimic my telling of stories about my Saudi students who, despite great obstacles, managed to do truly impressive work."